As an aside, I’m giving growing out my gray another go. I’m thoroughly sick of dying it every 3 weeks. I’m just going to TRY. AGAIN. to embrace it. If only it would just go gray overnight. That’s the REAL problem. Also it’s not really GRAY at all. It’s white. Which, in the end, will look pretty cool, I think. Here’s one for your Halloween spooky reading fun. 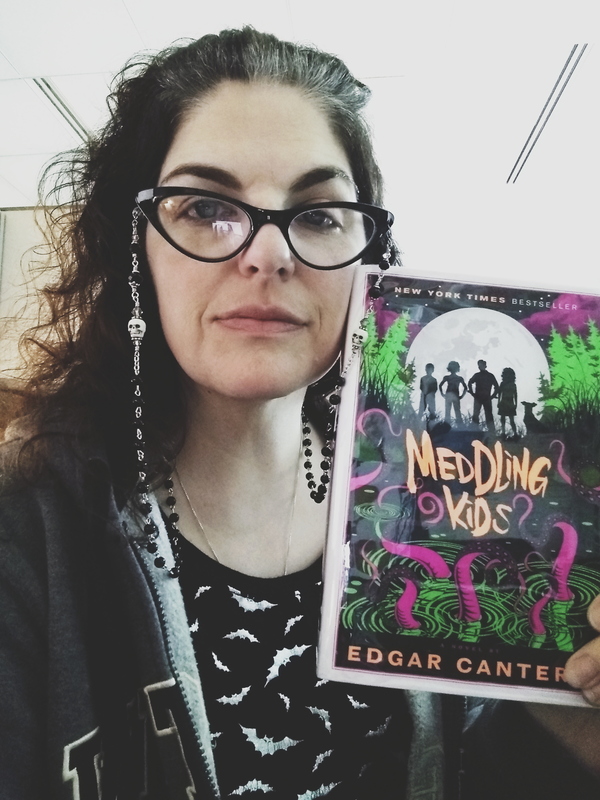 Meddling Kids, by Edgar Cantero. I’m getting through this one verrrrrry slowly because of all my reading for the class I’m taking that I don’t hate, addiction to British procedurals, and spending actual time with my family. Also there’s that whole job thing, but whatevah. Meddling Kids is very heavily inspired by Scooby Doo, but takes fun creative license. I haven’t got far enough in to tell who the bad guy is, but it’s definitely not a real estate swindler in a mask. I’m reasonably certain this is a take on the Cthulhu mythos, but we’ll see if I’m right. The writing style is very interesting. It jumps around a fair amount from reading like a television script to narrative to first person reflection, but somehow not in an annoying way. I don’t know how I feel about the characters yet. But I do love the dog(s). Jinkies! 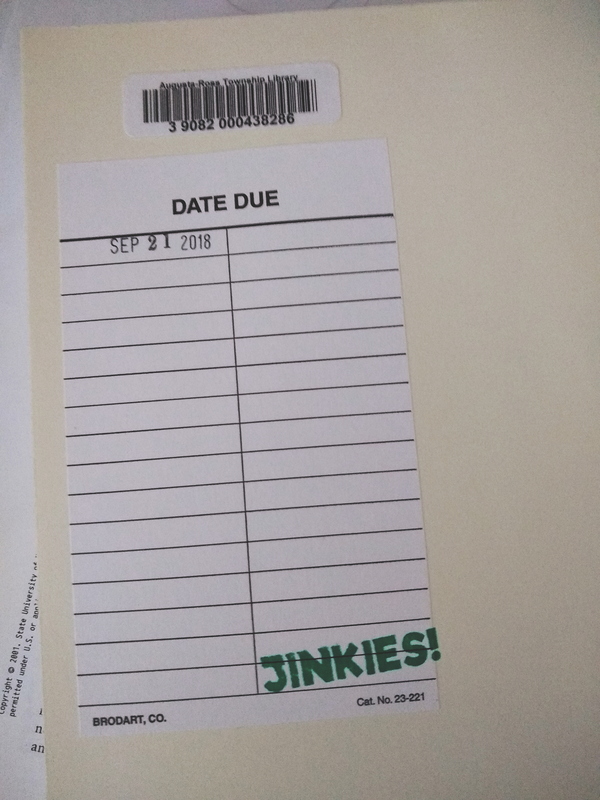 I need a stamp that says jinkies. Obviously. I even got this one from the library! Well, the Mister did, on account of he thought both Miss W and I would like to read it. She gave up before she finished the first chapter. Then it got stuck on our bookshelf where I discovered it looking for something else. Don’t worry, we renewed it. We’re not monsters. We’re not even real estate swindlers in masks who would have gotten away with it if it weren’t for … Also there’s the fact that the library bought this thing back in March and we were the first people to check it out, so I don’t think we’re depriving anyone. I’ll update you on this one later in the month, but for now, I’m recommending it – if for no other reason than most of you reading this post grew up on Scooby Doo, like I did, and you’ll enjoy it for the homage it’s intended to be. Also if you don’t love Scooby Doo I don’t even want to know you any more, because clearly you are a soulless ghoul-masked real estate swindler. P.S. I mean no disrespect to some very good friends of ours who are real estate agents and are honorable, upstanding, awesome people whom we are lucky to know. You know they must be good people if I’m qualifying my post. I clearly think very highly of them. I merely reference the bad guys in pretty much ALL Scooby episodes.